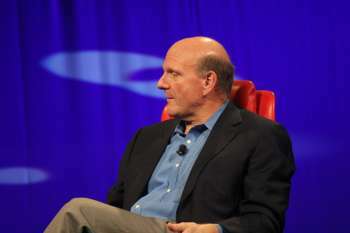 Ballmer at D8, "We were ahead of the phones game". Ballmer at D8, “We were ahead of the phones game”. Steve Ballmer, speaking from the stage at D8, has taken the chance to walk the party line, unsurprisingly. We all know Ballmer’s love for Microsoft, but in an unusually candid moment, Ballmer spoke quite truthfully on the mobile market. The argument, of course, is whether Microsoft was ever ahead in the mobile game. The chatter from the Cnet audience is varied, but brings up good points. Back when Palm decided to put WinMo on its phones, I’d say Microsoft was ahead. Not so much right now, but hopefully that’ll change with WinPhone7. The idea that Microsoft could invent Exchange, and lose the phone market is remarkable…shocking when you realize that most people want phones for two reasons, talk and check email.. Without a doubt, Microsoft has a lot of ground to cover in order to bring itself back up to speed in the phone market. Windows Phone 7 shows a lot of promise, but is still surrounded in vapor at this point.